When it comes to working out during pregnancy, there’s often a ton of mixed opinions. While many women are worried that physical activity during pregnancy can harm their babies, I am so happy to tell you that this is not the case at all-especially if you were given the clear from your OB/GYN. Research shows you might put on 7 pounds less than pregnant women who don’t work out, while still staying within the healthy weight-gain range. 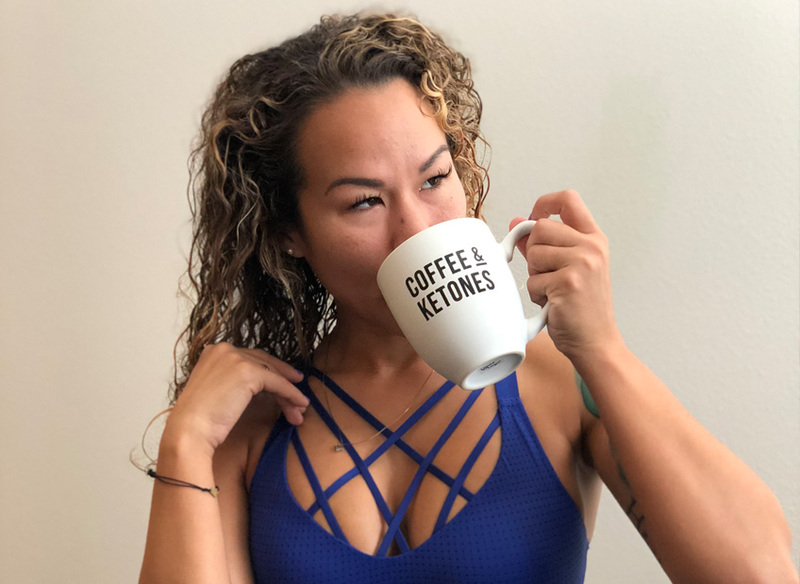 Not only that, but you are less likely to be constipated, experience pregnancy aches & pains, AND you will have more energy to get you throughout your day. And what about baby? The developing babies of prenatal exercisers have more efficient hearts than those of non-exercisers, and this higher cardio fitness level seems to last into the childhood years. Do listen to your body. Your body was created to do amazing things! After all, it was built to grow and birth a new life. While working out, be sure to listen to your body’s cues as it will tell you everything that you need to know. If you get dizzy, sit down. If something hurts, stop doing it. Your body knows its own limits better than anyone else so take it easy and do what feels right. Do make sure you are hydrated and fueled properly before a workout. At least 30 minutes prior to your workout session, make sure you eat a good well-rounded meal as well as drinking plenty of water. Too little food or water can result in an increase of fatigue and dizziness during workouts. Also, be sure not to eat too much prior to your workout as this can make you feel sick and sluggish. My perfect pre-workout meal is a small bowl of oatmeal, 1 boiled egg, and fresh fruit. Do aim for at least 30 minutes of cardio per day. Cardio is so amazing for the pregnant body! It not only strengthens mom’s heart, but baby’s cardiovascular system as well. Cardio is also a great way to control weight gain throughout pregnancy. Aim for daily walks or jogs, if your doctor approves. I personally hop on my incline trainer for 30 minutes everyday and rest on the weekends. Don’t perform any exercises while lying on your back for an indefinite amount of time after 12 weeks. After your first trimester, lying on your back can cause your uterus and growing baby to put major pressure onto the major vessel that returns blood to your heart. This reduces the blood flow to the placenta as well as to the rest of your body causing you to feel dizzy and potentially harming baby. Don’t perform any moves that can contribute to Diastasis Recti. Doing moves such as crunches, sit ups, planks, and twisting movements can cause your abdominal muscles to split into two halves. This condition is known as Diastasis Recti and it is very hard to heal depending on the severity. Personally, I do not work my abs at all for this very reason when I am pregnant. Don’t forget to stay hydrated! Hydration is key here! By staying hydrated during your workout, your body is less likely to overheat itself. Overheating can be a danger to not only you, but your unborn baby-not to mention that we already know that dehydration can make you feel weak and dizzy. If you feel weak and dizzy, you are more prone to hurting yourself during your workout. Aim for eight 8-ounce glasses per day (64 fluid ounces) of fluid, plus one 8-ounce cup for each hour of light activity. So, what exercises can you do to stay active during pregnacy? If your body is well-conditioned, you can do most activities that you were doing prior to pregancy-with your doctor’s approval. Exercises such as walking, swimming, jogging, and running are wonderful forms of cardio and should be done at least 3-5 days per week. Lifting weights is generally safe as long as you lift what you are able and don’t put too much strain onto your body. If your body is not used to lifting heavy then pregnancy is not the time to start your powerlifting career. Yoga is a wonderful and relaxing option for expectant mothers as it provides a means of increasing flexibility while decreasing pregnancy aches and pains. Some notable moves to try are Mountain pose, Triangle pose, Goddess pose, Cat/Cow pose, and Child’s Pose. What moves should be avoided during pregnancy? Any sudden, jerking motions are usually discouraged when working out during pregnancy due to the hormone called Relaxin which really loosens up you body’s joints and ligaments in order to prepare itself for delivery. These jerky movements can put strain on your joints and ligaments and you might hurt yourself. Other moves to avoid are ones that challenge your balance or that could cause you to fall as well as contact sports. As mentioned above, no moves lying on your back is considered safe. Also, make sure that you stay away from working out in hot temperatures. On a typical workout day, I get fueled up and start my routine by completing 30 minutes of cardio on my incline trainer. I love it because it allows me to change up the incline as well as the speed which keeps things challenging and fun! After my cardio is complete, I will take a 5 minute break and drink a protein shake and a glass of water. If I am starving, I will eat half of a banana as well. After my break, I will start the strength training portion of my workout which varies day by day since I am on a split routine. This means I work different body parts on different days of the week to give my body parts time to rest after being worked. 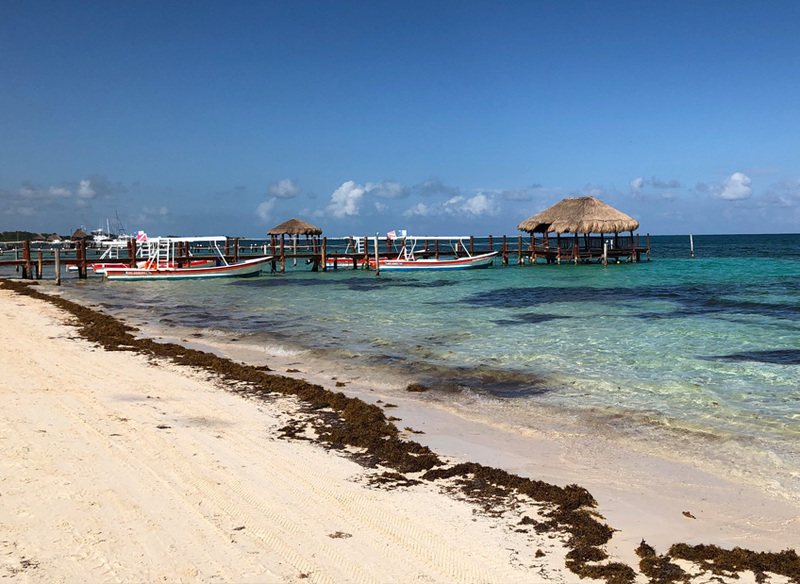 So, let’s say it is Monday. I will begin working my lower body after cardio using my barbell. A few moves that I will do are weighted barbell squats, weighted barbell lunges, and calf raises. I usually perform 10-15 reps with 3 sets per move and this completes my workout for the day. To help the time pass during my workouts, I am always listening to my workout playlist on iTunes. Just as I love my music, I know my baby loves to hear it as well because she always loves kicking to the beat! While I have my own headphones, she also has her own as well thanks to BellyBuds. It’s no secret that babies in the womb can hear very clearly by 20 weeks and by 30 weeks memories start to begin so I love this form of bonding along with her. I wish I had something like this for when I was pregnant with my son because he immediately recognized my husband’s voices and various songs I would play in the car while riding around with him inside my belly. 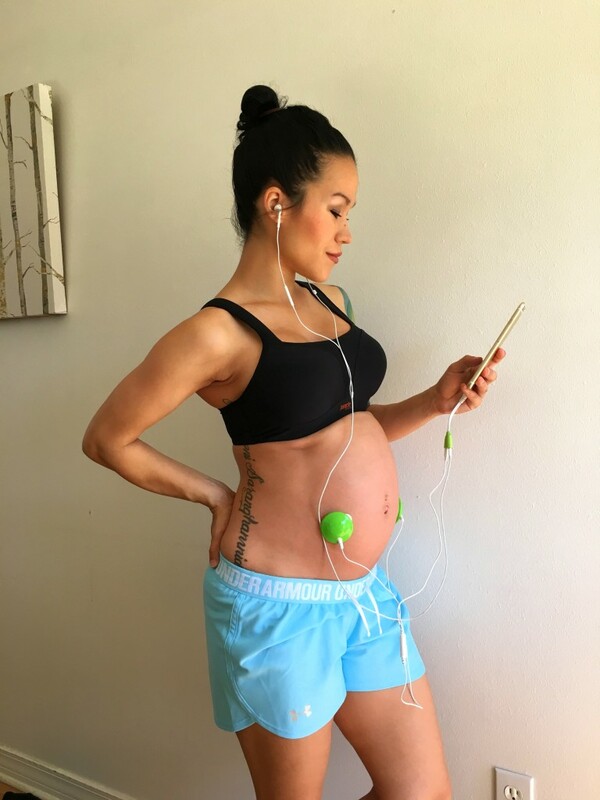 BellyBuds is a specialized speaker system that gently adheres to your belly and allows you to safely play memory-shaping sound directly to the womb. Whether it’s a soothing tune or a bond-forming voice message. 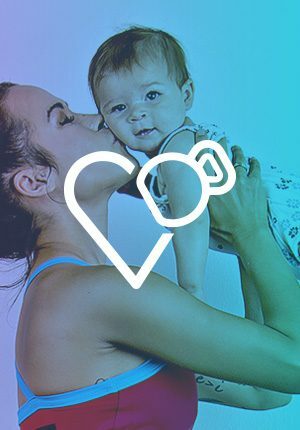 BellyBuds is a safe and effective first step in connecting with your soon-to-be bundle of joy. 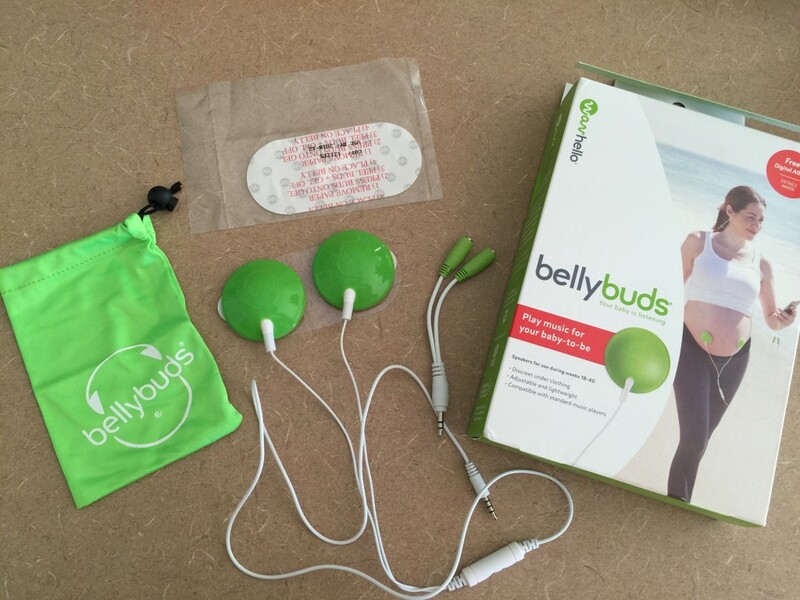 Easy to use, discreet and good on the go, BellyBuds works anywhere, anytime. That’s not all- you also get free access to the VoiceShare® by WavHello® app so that you and anyone you love can record messages, upload music, create playlists and even sing and send favorite songs that you can share with your child using BellyBuds. The buds simply stick on via a gentle adhevise and can be worn discreetly under clothing so that you can wear them wherever you go. What I personally think is pretty sweet is the fact that a percentage of your purchase goes to Children’s Hospital Los Angeles, Little Ripples, and Healthy Child Happy World. Even big brother likes to share our workout playlist with his little sister to be! He and my husband have been creating little voice messages to play for my unborn daughter whenever they aren’t around. It is such a sweet way for them to bond with her before she even gets here! It is even wonderful if you have long distance family members or surrogate parents so that they can connect, too. Oh, and did you know that it is also an amazing tool for helping to turn breech babies into the heads down position if you place the buds on the lower abdomen? Yup! It is highly recommended by OB/GYNS. 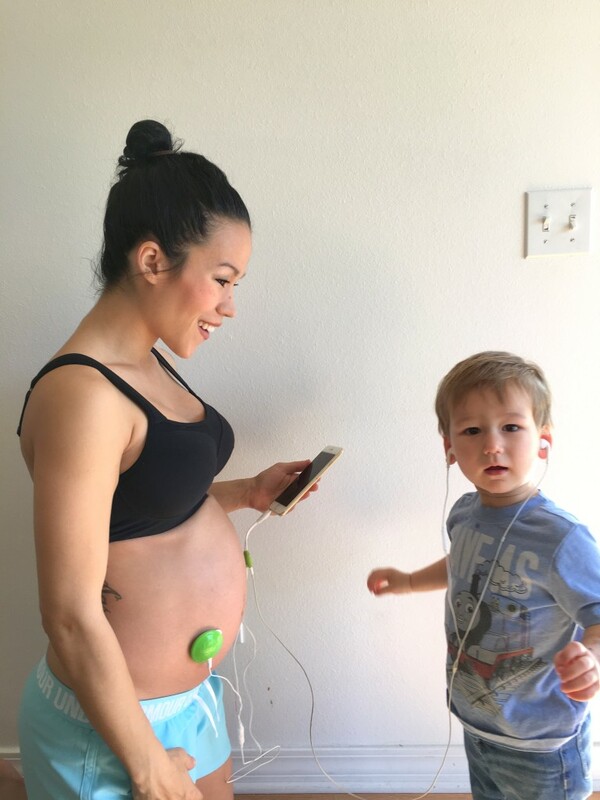 You can purchase your own BellyBuds on their website or from Babies “R” Us, BuyBuyBaby, & other fine retailers. Use my code FITMOMMY for 10% off your purchase Don’t forget to add these to your baby registry! As far as my postpartum workout plans go, I have often been asked what am I going to do once she’s born in order to get my workouts in. 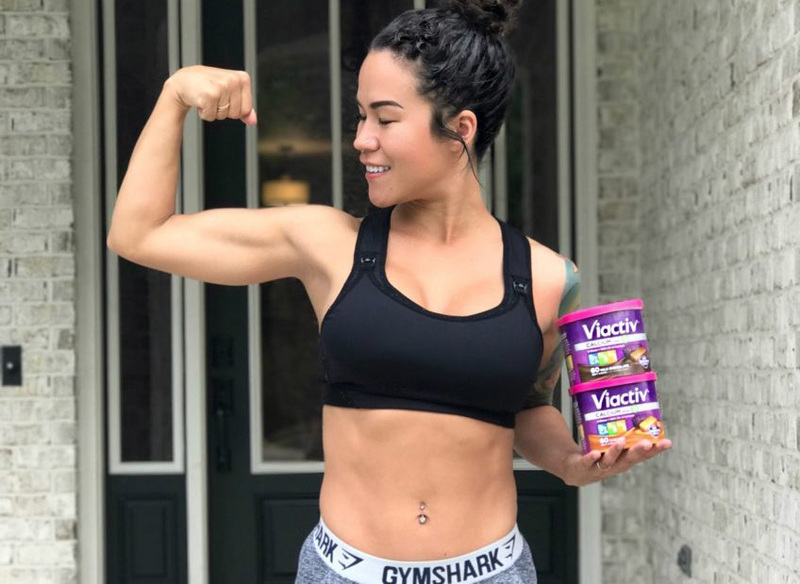 After all, being a new mom is already challenging in itself, but to now find the time to actually go work out can seem like a strenuous task. I am so happy to tell you that it IS possible to get fit after baby and I can prove it. Sometimes you have to include them into your routine and not be afraid to get a little creative.